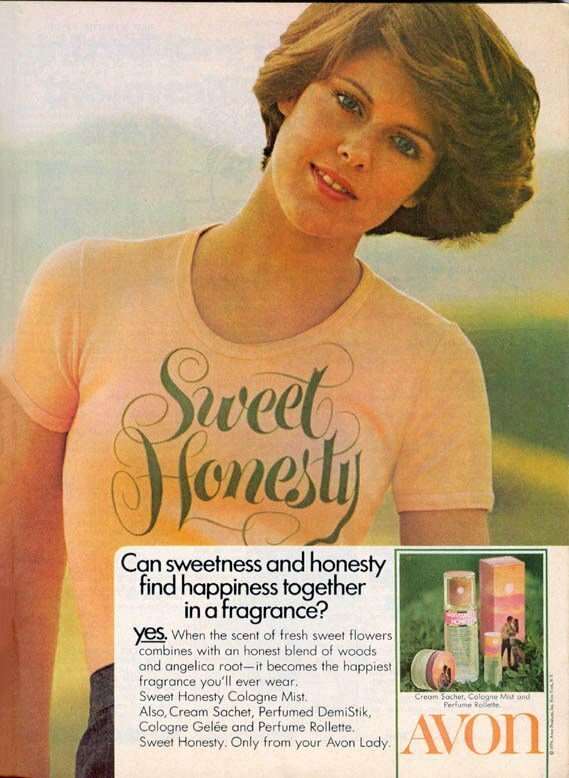 Sweet Honesty is a perfume by Avon for women and was released in 1973. The scent is floral-powdery. It is still in production. Sweet Honesty has been around for many, many years and there must be a reason. It's a perpetual favorite of many people. It's an inexpensive fragrance that one can store in their gym locker, car or what have you for when you need something inexpensive. The name I'm sure probably puts many off, but honestly, anyone who has ever tried Avon's fragrances has tried Sweet Honesty at least once in their lives. It's a good sleeping scent with its basic lightly spiced vanilla aroma that gently prods you to sleep, actually. It's comfortably quiet. It's nothing to write home about once you've graduated to the bigger bad girls. We all know that. This fragrance is a very light musk that turns powdery almost immediately with light woodsy notes. The one floral note of hyacinth balances the mix quite neatly to wrap Sweet Honesty together into a soft scent to wear when you need a fragrance that is unassuming yet very feminine. Sits very close to the skin for just a few hours, which again, is why this is perfect for sleeping. A very inoffensive scent that can be worn year-round. Write the first Review for Sweet Honesty!